The Mexico-Guatemala wall is useless. Most illegals in the U.S. from Guatemala to Argentina have passed that wall while the others have entered the U.S. through ports of entry and airports and have over stayed their visas. It's a myth that Mexico is strict on illegal immigration. Mexico is as strict with illegal immigration in their country as we are here and look at our mess. If Mexico was tough on illegal immigration we wouldn't have so many illegals in the country that entered by foot because would-be illegals trying to enter the US would not go to Mexico. I'm sure we get illegals entering from Canada but I'd guess not as much as from Mexico. People over staying their visas is a massive problem which can be easily corrected. Finally, no one ever talks about Chinese illegal immigration in California. People: even if he could do it, you really think that just building some wall is going to keep Mexicans out of the US? God, you're naive. Trust me, any wall you build can be compromised - especially in this day and age, especially when money gets involved. There will be people on the Mexican and American sides undermining it for profit. I'll tell you what would actually do it: improvement of Mexico's economy. This is the problem with conservatives: they actually think that shoving your head in the sand and ignoring the rest of the world is a valid strategy. Last edited by ambient; 05-24-2016 at 11:25 PM.. Your statement is a problem. The US is its own country and we are not a open country. We must control boundaries and start the process of repealing Nafta. Shame on Mexican Nations Flying the Mexican Flag on US Soil! If Mexican and other migrants would actually follow the un Immigration policy we would not have a problem. The other problem You guys do not go home. They have children here in the hopes of status. Liberalism this country do not have a clue. The wall is just a joke by Trump to get the hee-haw vote. He knows it would never be built and what would be the point, the cartels already built hundreds of tunnels under the border that coyotes could smuggle people across also if they really truly wanted to get across. 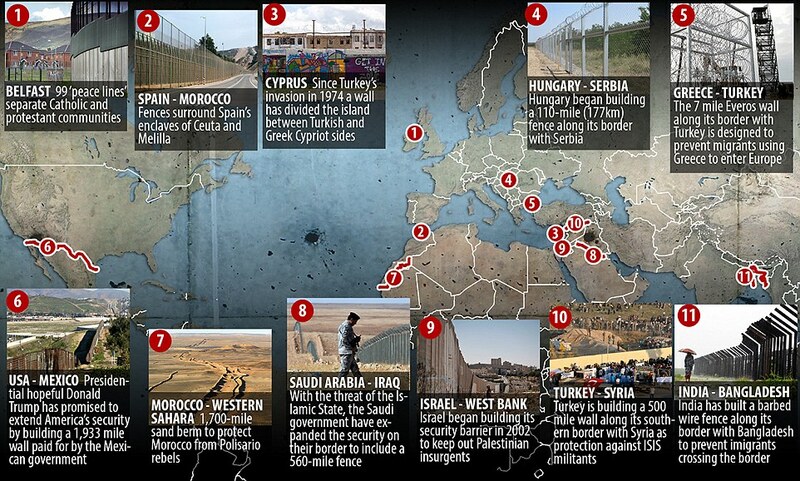 [LEFT] There are 65 countries either building walls, or which are already have them. I'm guessing they feel walls must be at least somewhat effective. As for Mexico's economy... that's for Mexico to solve, not us. Like, I know! I mean... the same with DOORS on houses, right? I mean, everyone knows they can just be kicked in or avoided completely... intruders can just break a window and climb in! So why have them!!! What's the hee-haw vote? Congress already approved a 700 mile long wall along the most porous areas of our southern border and that just needs to be built. Ever heard of tunnel sensors? It may not deter drug runners but it certainly would deter those coming here for economic opportunity such as for jobs and benefits. Frank DeSomma of Patriot Ordnance Factory is promising to donate one free gun for every guard tower built on the border wall [that Trump builds], which could cost the manufacturer "between $4.08 million and $10.2 million" [possibly even more if he throws in free shipping].